Many Iowa rural two-lane highways are safer today because of research and mar­keting by the Midwest Transportation (MTC) at Iowa State University on a roadway design feature called the Safety Edge, which is promoted by the Federal Highway Administration as a low cost countermeasure to roadway departures. Safety Edge is a 30-degree sloped pavement edge surface. The design allows drivers who drift off the roadway to more safely return to the pavement. The FHWA in 2010 estimated about 11,000 people are injured and about 160 people lose their lives each year in crashes related to pavement edge drop-off in the United States. Researchers at MTC have conducted several studies on pavement edge drop-off and found that 17 to 25 percent of crashes on rural two-lane roadways were possibly related to edge drop-offs. They also found that pavement edge drop-off crashes were almost twice as likely to result in a fatal crash as other run-off-the-road crashes. In a related study they found a 13 percent reduction in crashes when the Safety Edge was present. 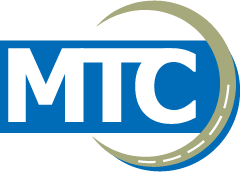 The Iowa DOT adopted the Safety Edge as a standard practice for construction and rehabilitation projects in 2010 based on recommendations from MTC and other researchers. However, agencies in Iowa were slow to adopt the Safety Edge. As a result, MTC researchers developed marketing and outreach materials and promoted the use of the Safety Edge to state and local agencies in Iowa. Consequently the Safety Edge was implemented in 473 miles of construction or rehabilitation projects in Iowa from 2010 to 2012. The safety edge adds 1 to 2 percent to total asphalt material costs. Use of the safety edge provides temporary safety during construction while the pavement edge face is exposed. It also increases production for contractors in states that don’t require shoulder pull up immediately after construction. In 2014 Iowa’s Linn and Jones counties won a National Roadway Safety Foundation Award for their joint use of the Safety Edge in Portland concrete cement. In a related study, MTC researchers evaluated the safety impacts of the Safety Edge. Crash modification factors (CMF) were developed using before and after crash analyses. A CMF of 0.87 was found for all crashes (non-intersection) and a CMF of 0.84 was reported for injury crashes. Using this information it is estimated that about 41 crashes are reduced annually across the 473 miles of known installations with an estimated reduction in societal costs of $3.5 million.